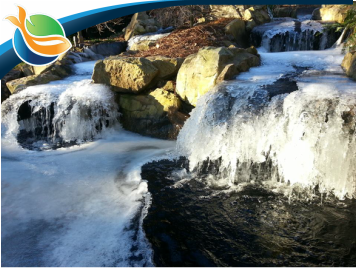 Based in Buford (GA), Paradise Ponds & Waterfalls offers winter pond maintenance in Fulton and Gwinnett County areas of Georgia (GA). The most important rule during the winter months is to keep your waterfall pump turned on. The freezing temperatures typically only last for a fews days. Another important winter pond tip is to stop feeding your pond fish when the water temperature drops below 55 degrees. You probably won't need to feed you fish at all in January and early February. Our winter pond check ups make sure everything is still running properly even if some snow or ice are in the way. 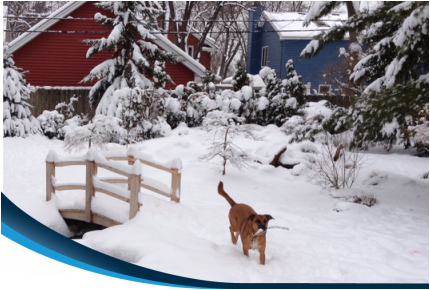 This winter pond check up usually is done in January and provides peace of mind to you prior to Spring arriving. A north Georgia pond in winter time. The aesthetic rewards of the winter pond are absolutely beautiful! The water flowing below the ice and the snow covered rocks are a unique thing to see here it Georgia. Ice and snow will typically only be around for a few days during the winter months in the North Atlanta suburbs. A floating Aquascape Pond De-icer. Controlled by a thermostat, the unit only runs when the water temperature is at or below freezing, heating only the surrounding water to just above freezing, and then shutting off again. These units are option for your pond in Atlanta, but you would probably just get a couple days use of it per winter season here in Georgia. We just wanted to let you know that they are available, but typically they are not needed.